Located in scenic southwestern Utah, St. George is increasingly being recognized as one of the most desireable recreation and vacation spots in the West. The famous St. George climate, balmy in summer and surprisingly mild in winter, is only one of many reasons to fall in love with this magnificent hidden treasure. There are many others besides, including the recently designated Bears Ears and Gold Butte National Monuments. 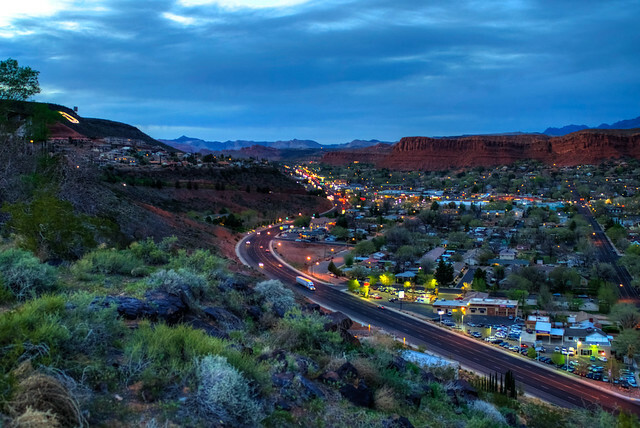 With forests, rivers, lakes, canyons, hot springs, sand dunes and mountains within easy driving distance, there is always something new to explore around St. George. If wilderness is not on your agenda, you still won’t find a better place to relax and unwind than St. George. Due to the amazing weather allowing for play in all seasons, St. George is Utah’s golf capital, home to some of the best golf courses in the southwestern U.S. From championship courses such as The Ledges and Sand Hollow to more casual play at Dixie Red Hills, each of the many fine courses in the area offers unique views, top-notch greens and endless fun. If shopping is your style, you’ll love what St. George has to offer. Memorable Ancestor Square, which features 12 historic buildings from Utah’s past, is home to several unique boutiques where you can find jewlery, art, clothing and crafts. St. George also has malls and outlet stores for trendy fashions at bargain prices. There is no lack of entertainment in St. George, with world-class music venues, museums, theaters and art galleries. Catch a concert surrounded by stunning red-rock cliffs at Tuacahn Amphitheater, or thrill to the power of live theater at Brigham’s Playhouse. Attend a Shakespeare Festival, let the Southwest Symphony take your breath away, and go back in time to see dinosaur tracks and fossils at the St. George Dinosaur Discovery Site. Visit the place “where the summer sun spends the winter” in St. George, Utah. Plan to stay a while.